Despite spending enormous sums on technology and improvement methods, most businesses are under siege. 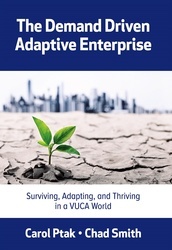 The inability to drive adaptation to an increasingly more volatile, uncertain, complex, and ambiguous (“VUCA”) set of circumstances has resulted in an unprecedented rate of failure across organizations of all shapes and sizes. Worse yet, the necessary component to break the cycle is being distorted by antiquated models, methods, rules, and tools held over from decades past. Industry is stuck in a rut, and that rut is getting deeper and deeper.